Wärtsilä JOVYATLAS has designed battery cabinets optimized for its UPS Systems. The battery cabinets are made of a steel plate frame with removable grids for the batteries, enabling easy battery installation. Connecting multiple battery cases is possible without a problem. Of course, the battery cases provide sufficient space for the corresponding battery fuses. As standard, the cases come provided with a RAL 7035 (grey) coating. Other coatings or custom colors are available on request. The battery cabinets are made to the needs of the customer accordingly. Thanks to the mechanically very stable design with drawers the battery cabinets of type BC are designed especially for robust use on ships, in industry but also for example in mining. 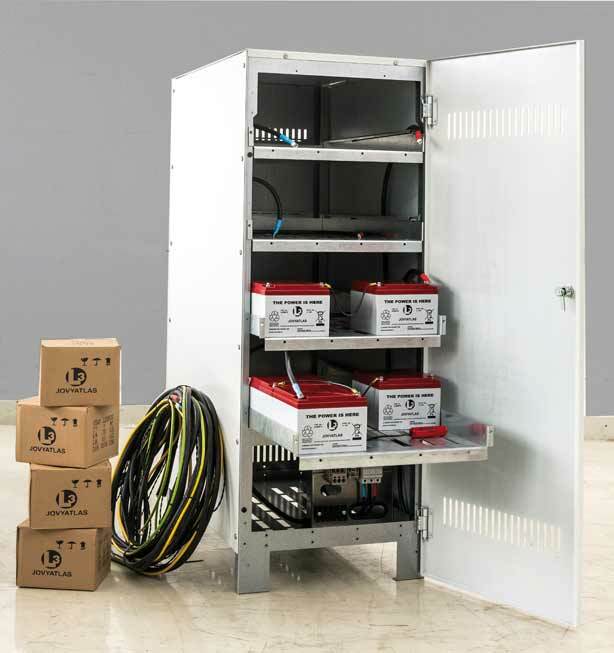 The battery cabinets in this technique are characterized by high mechanical strength, safe contact protection (no open-access batteries), very good accessibility of all monitoring equipment and quick and easy installation of the batteries. The efficient design with battery bays saves time and money during battery replacement or maintenance.